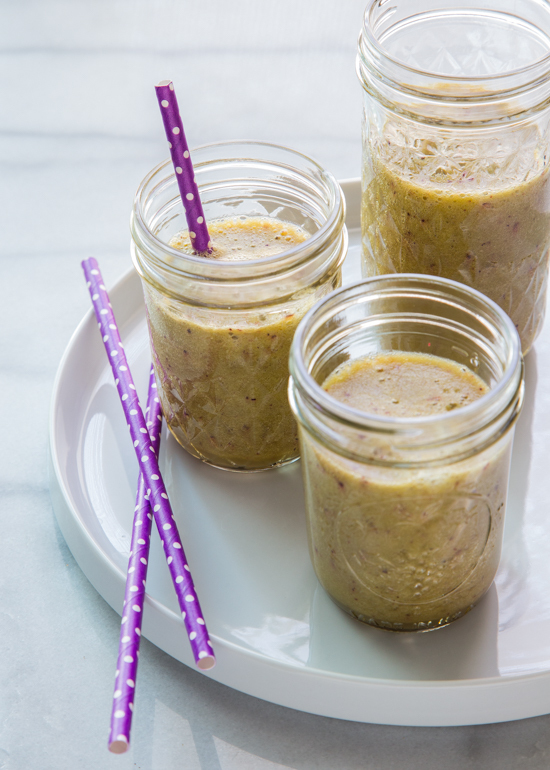 Have you tried smoothies for breakfast? These easy and adaptable fruit smoothies are great for back to school mornings and the kiddos love ’em! I am having a hard time coming to grips with the fact that school is starting in two days. Two. Days. I’m not kidding. The Buddy informed me that July is the only month of the year that he doesn’t attend school. As in he goes into June and starts in August and frankly, I kind of miss the old school 3 months off of school. Now it’s barely two. Oh well, c’est la vie. I’ve got to roll with it and I have been to the best of my ability. I’ve got visions of Fiskars scissors and crayon boxes floating into my dreams and middle of the night panics that I forgot to buy him new pants this year and that he’ll have to wear his two short, hole in the knee pants the first week because I can’t find slim size 6 pants anywhere in town. Then I remember that I do in fact have properly fitting uniforms for him and then fall back in a slightly less fitful sleep. Can you tell that I’m someone who takes worrying pretty seriously? If extreme worrying was a sport, I’d go pro. It’s my way and I’m not sure how I would operate if my life were worry free. I’m stressing myself just thinking about this, so let’s get to the smoothie already. So, yeah. 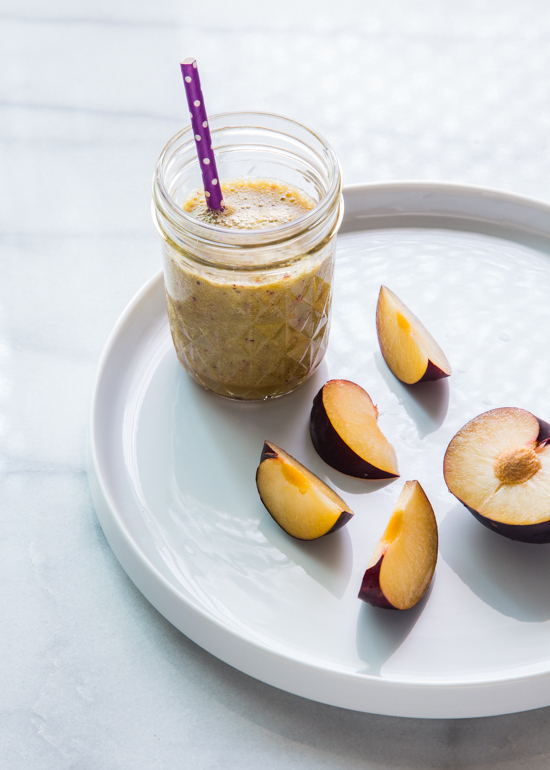 This week’s smoothie edition is extremely simple and totally adaptable. I was looking for some smoothie ingredients the other day and came across an orange and some plums in the fridge. I throw those in the blender with some coconut water and our usual fruit staples – apples and bananas – as well as some romaine for a bit of ‘green’ as well as a super fresh and not overpowering ‘green’ flavor. It’s one of the greens that my kiddos enjoy the most in their smoothies. If you’ve never thrown romaine in a smoothie, try it! It’s totally surprising and fabulous all at the same time. I’m thinking this will make a great back to school breakfast…probably alongside a giant stack of chocolate chip pancakes. Life’s all about balance, am I right? Put all ingredients in a high powered blender in the order listed. Blend until smooth. Smoothie is even better after chilled for a couple of hours or overnight. Enjoy!